If there is a stand-out team in Orangeville hockey this season the Orangeville Tigers Novice B team have earned some serious recognition for their efforts. The Novice girls team took only one loss for the entire season and came out on top in the Lower Lakes Female Hockey League with a 22-19-2 record and 40 points – ten points ahead of the second place team in their division. The team scored 80 goals over the season while allowing only 24 against – that averages to barely above one goal per game the team let slip by – thanks to first year goalie Caitlyn Elliot and some solid defensive team effort. The team is playing in a 36 team League which makes their results of coming out on top even more impressive. At the start of the season coach Steve Bloxam wasn’t sure how the team would do as there were several new players and the team didn’t appear to be highly skilled in the early going. However he worked with the team during the pre-season and saw some immediate improvement as the girls started figuring out the game and working on their skills. By the time the season started the team had come together and knew what to do on the ice. Their skills as hockey players had improved and they started winning. In addition to regular League play, the team won gold in the Etobicoke tournament in October then came out on top again in November in a tournament in Stratford. As top seed in their division the squad is now getting ready for the League playoffs that will get underway on January 30. 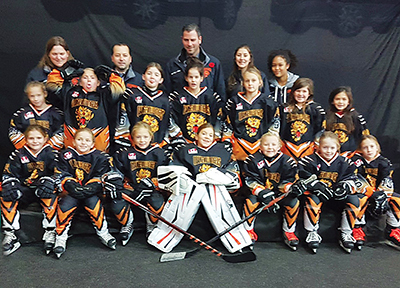 The Tigers Novice B team will compete in the hometown Sweetheart tournament this weekend in Orangeville.